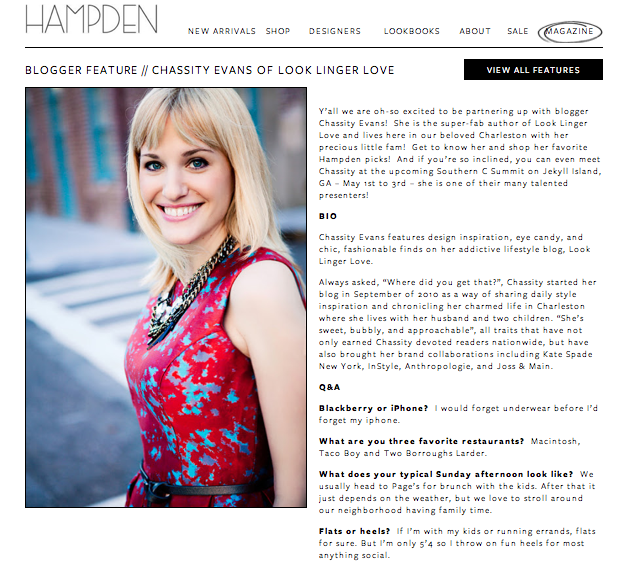 I am so so so so happy to tell y’all about the collaboration I had with Hampden Clothing as their very first guest style editor. If you haven’t been to Hampden’s site in awhile then get ready to be blown away because it’s all sorts of pretty and fun to look at. I especially love their “magazine” feature full of party pictures, behind the scenes gossip, fashion features, and designer interviews. Charleston is incredibly lucky to have Hampden Clothing located right downtown, so I was able to stop in to hang with the owner, Stacy Smallwood, while taking my time choosing my favorite Hampden picks. One of these favorites is this amazing Current/Elliott & Mary Katrantzou collaboration shift dress. How fun is the print? And naturally I had to mix Hampden’s two brightest pieces together. I think the Malene Birger lace top pairs perfectly with this Timo Weiland skirt. And of course the Tucker and Loeffler Randall shoe collaboration of floral loveliness that can go with pretty much anything. These hardly even scratch the surface. Go check out all of my 12 favorite Hampden picks right here. And there’s also a fun little LLL + Hampden q&a that I took part of where I admit that I would forget underwear before I’d forget my iphone. You know, just keeping it classy one day at a time. But really, I dish on my favorite Charleston restaurants, who’s closet I want to move into… It’s fun stuff. love the outfit with the two brights paired together but you know my heart skipped a beat for that last grey striped dress! Congrats Chassity, such an exciting endeavor! Love the striped dress! ooooooo, love the skirt & lace top combo. gorgeous!! Congrats!! That striped dress looks fabulous on you, definitely my favorite! I am going through Charleston withdrawal. I always love visiting Hampden. I love the last striped dress! Do you have a link to it? I can’t seem to find it! Absolutely love the striped dress! Such a great feature and what a great idea by Hampden. Secret I don’t like dogs either and we have one because Matt insists on it. But I am so not a pet person. Kids are enough for me to take care of. You better buy that Tibi dress love it. love your picks!! The last dress is my fave! But of course you look fab in everything. Yes, great post!! I’d also love a link to that last grey striped dress.